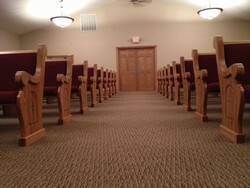 Today we are in Petersburg WV at Saint Johns United Methodist Church installing church pews. These West Virginia roads are no fun pulling a 40ft trailer through. We drove right past the church driveway and had to find a place to turn around. That is a difficult task to do in a truck and trailer. Nick and Ax slept about all the way here. As soon as we had most of the stuff unloaded it came a huge downpour with hail and very high winds. I thought it was going to blow the truck over. The town was supposed to have a parade for their county fair, but i would imagine it was rained out. This is beautiful country out here. There is just no easy was to get anywhere. lol. We are going to drive straight back home tonight. I am ready to spend a few days at home. I want to take this time to praise God for all that He has done in my life. Thank you Lord for being my Savior!! !